My trip to Ottawa and Can-Con 2013 got off to a rocky start. I rushed home from work to change clothes, grab my bags and take a cab to the airport–only the cab that I called never showed. “Soon” according to their dispatcher does not mean the under fifteen minutes that I’d expected. Call me wacky, but I like to arrive early for flights. I like having a chance to read a chapter or so in a book. Pick up a snack, or in Friday’s case, actually have some supper. So with my plane boarding in twenty minutes and me still at home, my skin was turning greener, and my purple pants were a-tearin’. Fortunately, one of my pals saw my Twitter fury, and zoomed to the rescue and got me to the airport three minutes prior to boarding saving an entire cab company from my Gamma-powered vengeance. By the time I rolled into Ottawa it was after midnight and the ChiZine room party had been shut down by security (in flak jackets, no less, well done, my friends!) so I wandered up to the convention’s Hospitality Suite, but I didn’t recognize anyone. As I had been feeling run down all week, and the stress of almost missing my flight made me just want to collapse, that was what I did. I didn’t sleep well, I rarely do the first night in a new place, but I also really need to stop starting a convention weekend already feeling run down and exhausted! Saturday morning I woke up feeling hungover. I hadn’t even had a drink, which is wholly damned unfair, but maybe you can get a rage hangover? Not sure. Headache aside, I wanted to have fun, and needed to feel human before my first panel (luckily not until noon). Derek Newman-Stille of Speculating Canada asked me to join him for breakfast and we had a great conversation. This was my first time meeting Derek in person, but he’s interviewed me before on his Aurora nominated (and now Aurora winning) blog. I have to give credit to Derek for that interview, because his questions really forced me to interrogate my own writing (his words) and in thinking of the answers to his questions, and thinking about my writing, it became easier for me to discuss my work. Shortly after breakfast, I bumped into my good friend (and Guest of Honour at Can-Con this year), Robert J. Sawyer, who presented me with my Aurora Award nominee pin! My Saturday panels included the Business of Writing, where I was joined by moderator Suzanne Church, Karen Dudley, and Jean-Louis Trudel. I had a lot of fun on this one, Suzanne is dynamic and energetic and kept the energy level up. I think we had good conversation, and good questions. After the Business panel, I met up with my fellow panelists for the National Novel Writing Month! Aspiring Writers: Do it! 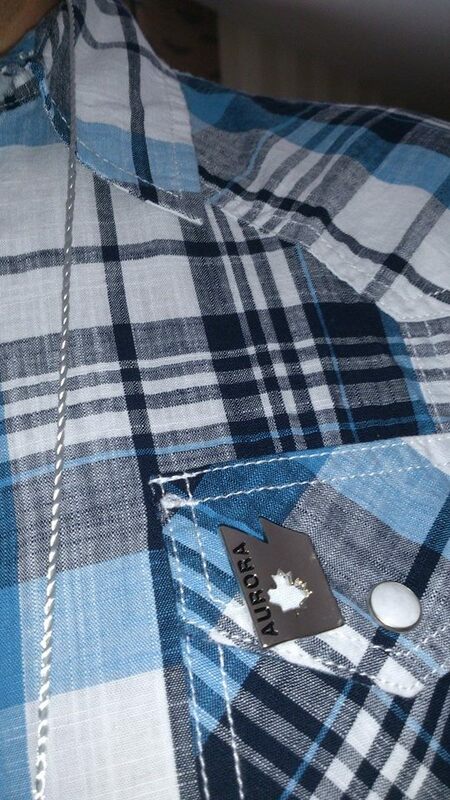 Commit! Commit! Nicole Lavigne, Geoff Gander, and Maaja Wentz, we were joined by Barry King, and Rebecca Simkin, and hashed out how we wanted the panel to go and I think it went well. I’m planning on doing NaNoWriMo again this year, so hopefully we’ll all buddy up in November and keep each other motivated (and honest). It was a small dealer’s room at Can-Con, but it was full of books. I left with Joey Comeau’s The Summer is Ended and We Are Not Yet Saved, because it looks awesome (and because it came with a free barf bag–that’s some good marketing, ChiZine Publications!) 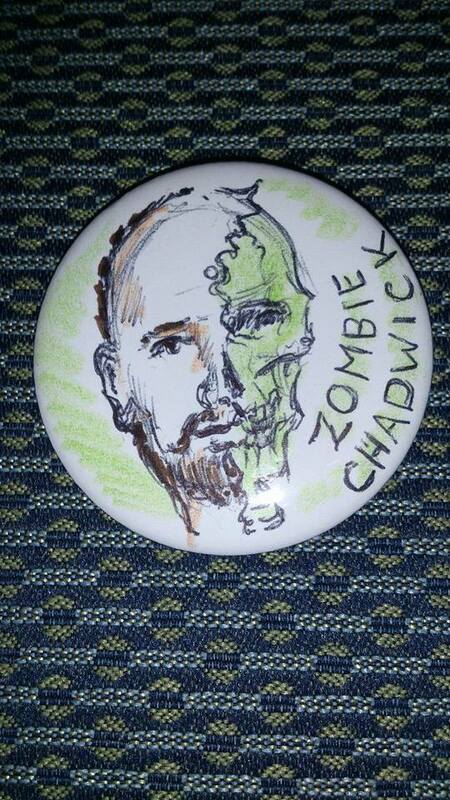 I also had this button made by one half of the Victoria Dunn writing duo who authored Alice Hearts Welsh Zombies. After the NaNoWriMo panel, it was time for supper with Team CZP, and we had a great meal at a Som Tom Thai. Fantastic food. Fantastic company. Also, hijinks ensued (as they usually do with CZP) thanks to Brett Savory and Matt “Photobomb” Moore. And this was not photoshopped, it happened live, I assure you. Photo credit: Brett “Authentic” Savory. Bellies full of spicy goodness we rambled up to the Bundoran Press room party–which was also promptly shut down by security in flak jackets. Are creative types really that dangerous to Ottawa? No, wait, don’t answer that. Not to worry though, we found our own fun. I cut out (relatively) early, knowing I had a 10:00 am panel on Creativity in Fandom. Still woke up with a headache, but I mostly managed to chase it away with judicious applications of fresh fruit and Gatorade before me and my blue tongue were joined by Errol Elumir and Debs Linden (AKA Filk duo, Debs & Errol, Aurora nominated for their CD, Songs in the Key of Geek). I did not win the Aurora for Best Novel, but I’m over the moon for Tanya Huff, who truly deserves this recognition for her excellent book, The Silvered. I was also incredibly happy for Robert Sawyer, who received a Lifetime Achievement Award this year at the Auroras (he’s put his acceptance speech up on his website, and it’s good one). This year’s ballot in all categories was packed with friends and people whose work I love and admire, so I am honoured to have been counted among them this year. It was also announced that Canvention, the Canadian national SF&F convention (which presents the Prix Aurora Awards) will be hosted in 2014 by V-Con in Vancouver! This is really exciting news, as I was already planning to attend V-Con next year. Double the pleasure! Tonight I launch Tombstone Blues at Books on Beechwood, 6pm, then Wednesday I’m in Toronto reading for ChiSeries with Chantal Guertin and Evan Munday! We’ll be joined by Aurora winner Kari Maaren and her ukulele. Big thanks to my friends and family in Ottawa and Toronto for chauffeuring me around and putting me up after the conference, and to Ravenstone Books for sending me out here! This entry was posted in Uncategorized and tagged Books on Beechwood, Can-Con, ChiZine, NaNoWriMo, Prix Aurora Awards by chadwickginther. Bookmark the permalink. Thank you Chadwick! I was so honoured to finally meet you in person and have a chance to chat with you about more than Canadian Speculative Fiction. It was great to have tonnes of laughs with an author whose work I truly enjoy and respect. I am really happy you could make it to Can Con this year! You’re very welcome, Derek! It was a great pleasure for me to finally meet you! Here’s hoping we cross paths at many more conferences. Great Round-Up! Thanks for including your zombie button. My pleasure! Great to meet you!